In Fun with Genealogy Files Part 3, I shared my obsessive need desire to create virtual place holders. Ones that match the paper file place holders I made for each of my direct line ancestors. You’ll be pleased to know that I have been plodding along, methodically moving documents into their respective folders. It isn’t fun, but somebody has to do it. And until I win the lottery, I have no hope of hiring anyone to do it for me. In the meantime, I have been working on upcoming blog posts. Which require photographic accompaniment. And that, dear readers, has been a bit of a nightmare. Not that I don’t have pictures. I have plenty of pictures. And plenty of digital images and lots of scans of perfectly lovely pictures. But finding a specific photograph or digital image in my collection wasn’t easy. In fact, it was downright hard. My every-once-in-awhile scanning sessions resulted in folders full of non-related pictures. I tried to arrange them chronologically but I didn’t always know the date on which the picture was taken. And there were so many pictures! Every time I opened a folder I would cringe. It took crazy amounts of time to find the specific picture I sought. Most of the time I would settle on a different picture because the search was so frustrating. Then one day I had an epiphany. I could sort the photos by name. By name! Can you hear the picture fairies singing? I created folders for myself and my husband, our parents, siblings, children, grandchildren, animal companions. I gave place names to folders that would contain pictures from our gardens or home improvements or vacation spots. 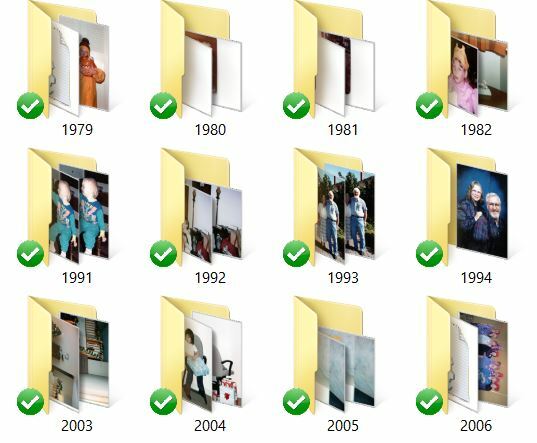 When pictures contained more than one subject I would simply right-click, copy and paste into each additional subject’s folder. In one weekend I sorted 992 photographs. There are thousands more to sort. And of course I’ll have to edit them and probably rename them. But that’s okay. Because I no longer cringe when I open a folder of pictures. I smile at the memories. Great ideas! 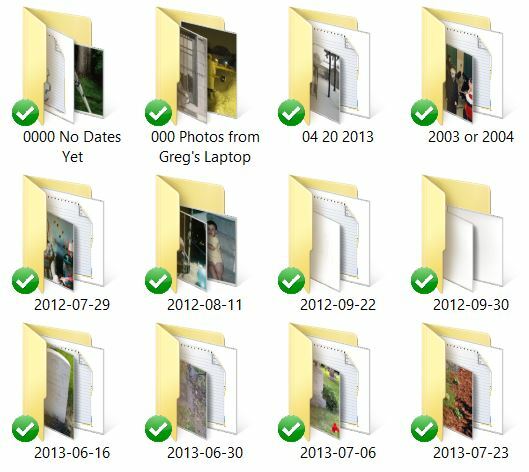 I’ve been slowly doing some of that, but then the folders grow subfolders and subsubfolders…. Oh my gosh, I know exactly what you mean. If I could just get all of my paperwork under control, I could rule the world!